Remember Welt, the smart belt that came from Samsung's in-house incubator program? Well that same program, C-Labs, has birthed some new ideas that Samsung is going to nurture into (hopefully) fully-fledged products. First up we have ItsyWatch, a wearable virtual pet for children, which Samsung says is designed to "build good habits". Maybe it's just because we miss our Tamagotchis, but we really like this idea, and can see it being a hit with kids. 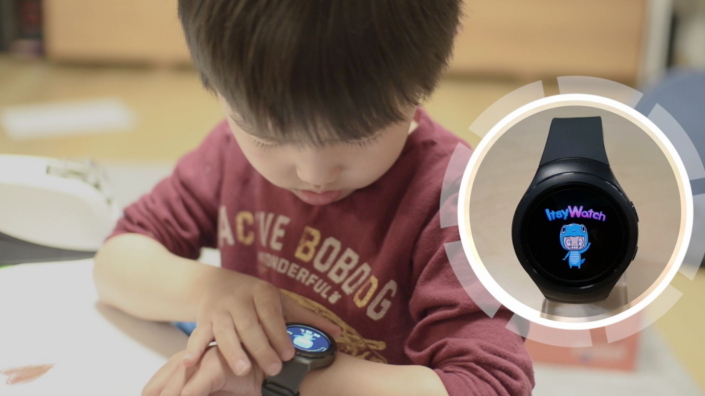 Plus, Samsung says ItsyWatch should "relieve parental stress", which could make it a hit among adults too. LiCON brings a new angle to the smart home, letting you control all of your IoT devices by taking a picture of them. Snapping a photo of the device within the LiCON app will then cause the appropriate appliance app to open instantly with all of the relevant controls. The idea is to make controlling the smart home a more straightforward experience. Samsung has two head-worn devices. The first is a sensor for helmets called Ahead that offers hands-free calls and notifications to the wearer, as well as music. Unlike PhiPAL's mountable sensor, it doesn't seem like it will monitor your activity, instead focusing completely on communication. The second device is a wearable 360-degree recorder that wants to be more subtle than most. FITT360 is a hands-free way of capturing VR-ready footage, and looks like it might not be uncomfortable to wear. Samsung's C-Lab is designed to encourage company employees to think of new ideas, and while there's no guarantee we'll see all of these ideas come to fruition, there are . You can see more on the latest ideas here.